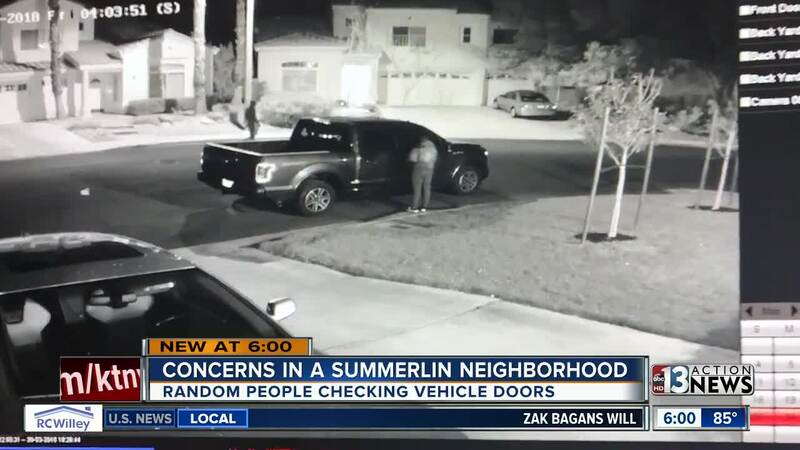 Neighbors in one Summerlin neighborhood are dealing with random people checking to see if their car doors are open overnight. They say the problem has been going on for months. Folks living along Canyon Breeze Drive say during the day, the neighborhood is the peace and quiet that they're accustomed to. But it's what happens when the sun goes down that has this neighborhood on edge. “It’s not unusual to just be walking around at 2:30 in the morning up and down the street trying to open cars,” said Gabrielle Raleigh. The incidents have been caught on home surveillance cameras. As recently as Sunday morning, the video shows two men approach one of Raleigh’s vehicles in street and another in the driveway. “I was home alone with my daughter so it’s just very uneasy," said Raleigh. The uneasy feelings were echoed by others who live nearby. 13 Action News spoke with one neighbor who did now want to go on camera, fearing that they will come face to face with the crooks. "They’re casing and if I’m at the wrong place at the wrong time and that's really what frightens me, is that its happening right here in front of me,” said the neighbor. CrimeMap reports since the beginning of October, 13 burglaries and 8 vehicle thefts had been reported in the immediate area near Lake Mead and Rampart Boulevards. “It’s a beautiful neighborhood, it’s a beautiful community and it's ridiculous that this is happening,” said Raleigh. 13 Action News has contacted police on this issue.